I had no plans to bake or post anything this weekend and ended up doing both. It has been a rough couple of weeks and I felt too wiped to do anything, let alone bake. But somehow this afternoon I found myself needing to occupy some time while visiting my parents and the first thing that came to mind was cookies. Though baking anything at my parents place is a little bit more difficult than you might imagine. You see when I moved out I took everything with me. Granted, it was all mine to begin with :). I remember how befuddled my mother was realizing that she would have to buy flour for the first time in years or discovering she had no sugar for coffee. But if there is one thing my mother always has on hand, it's peanut butter. She's as much of a peanut butter fiend as I. As a result, I figured the simplest most crowd pleasing thing I could bake with limited supplies was a batch of peanut butter cookies. There really is nothing to these cookies. In fact, I made them more complicated by adding honey after a very large reduction in sugar. Typically when making flourless peanut butter cookies a lot of sugar is added in order to increase the volume of dough, sometimes a full cup. The Kraft recipe originally uses a half cup which I promptly reduced to one tablespoon sugar and one tablespoon honey. Personally, I'd rather have fewer cookies and more peanut butter flavour than more cookies that are overly sweet. Call me a snob, but I honestly can't remember the last time I made cookies without a cookie scoop. This lead to monstrously large cookies that were way bigger than what I typically bake. It's a good thing I'm not picky..... about cookie size. If you tried, you could probably make twice as many cookies as I. However, because of the thickness of my cookies they were crispy on the outside but soft, chewy, and peanut-buttery on the inside. They totally stick to the roof of your mouth, which is a terrific thing in my book. You might try and bake them a little longer, but the bottoms were quite dark and very much done when I took them out of the oven. Besides, the chewy centres only enhanced the ridiculously good peanut butter flavour. And I'm in no rush to fix what ain't broke :). 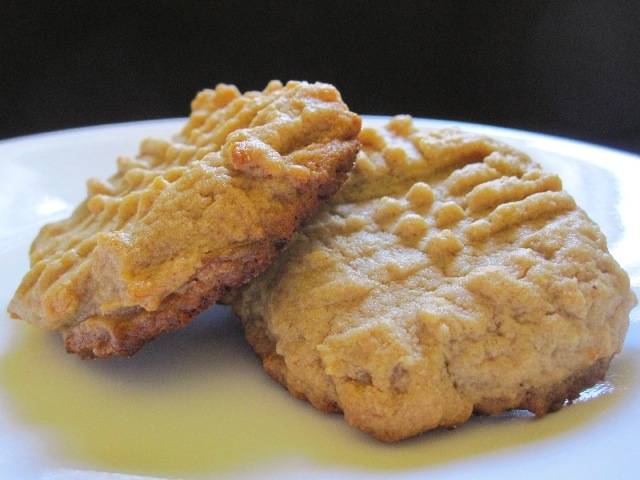 These peanut butter cookies are fantastic and can be done in a pinch with absolutely no forethought. A few minutes in the kitchen and they're ready. So if company shows up and catches you unawares and with nothing to serve, these are the cookies for you. Unless I'm that company. Then feel free to forgo the cookies for a bowl of peanut butter and a spoon. But class it up, use a nice bowl :). Preheat oven to 325 and line a cookie sheet with parchment paper. In a large bowl add peanut butter, egg, sugar, honey and mix until completely combined. Drop by rounded tablespoons onto prepared cookie sheets and flatten with a fork to make criss cross pattern. Bake for 15 to 20 minutes or until the edges of the cookies are lightly browned (this was 16 minutes for me). Allow to cool on cookie sheet for 5 minutes before moving to rack to cool completely. I made a version of flourless peanut butter cookies when I was just starting to bake that had lots of butter as well as sugar--your version looks much better than mine, and probably tastes more peanut buttery, too! I love your description of how you are the only person in your childhood home who really uses flour and sugar--my mother didn't even have loose sugar in the house to offer visitors for coffee! Amusingly, my childhood home was my home up until two months ago :), I guess I made it sound a lot longer than that. That's what happens when I go from recipe to post in a few hours (unheard of for me :)). I've made a few different flourless PB cookies and these are definitely the winners (Kraft are the PB kings :)). There is nothing to get in the way of the peanut butter flavour with so few ingredients :). My favourite PB cookies are incredible, but they require a lot more time to make, and more time spent baking cookies, is less time spent eating cookies :). require! Nice to know they are gluten-free too! Could you use an egg substitute? I'll bet truvia or splenda would work as the sweetener too! @Mary - You should definitely try them, they're almost too easy not to :). And thanks so much for the comment on the image that means a lot coming from a pro :). @Gloria - I've never worked with egg substitues. Can you use an egg substitute in a cheesecake? If so than I'm sure it would work for these cookies. As far as the sweeteners, those would definitely work, especially since theirs so little of it :). Though you always have to worry about aftertastes. I love both coffee and peanut butter, but for some reason I don't love them together...then again... I'm a bit "off" :).